Can I afford to buy a new car this year? How much could we save towards a house deposit? Financially, when is the best month to take holidays? How can we reduce expenditure? Why do I not have any savings? What would be the impact of changing my job? 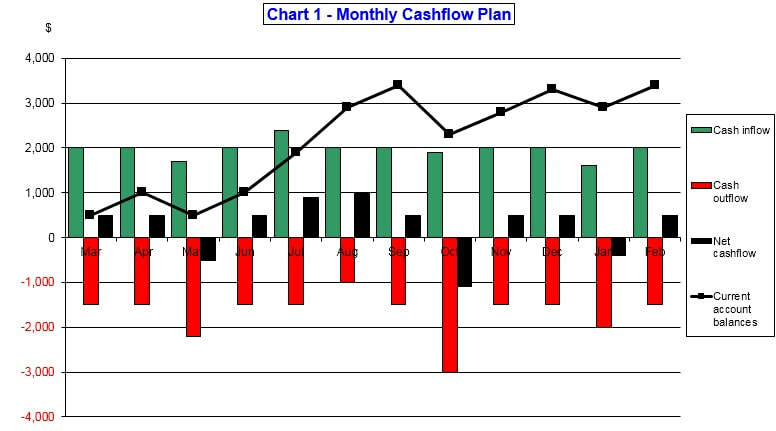 Cashflow Plan is available as Free and Premium versions for immediate download. Both versions are powerful, easy-to-use Excel-based templates for preparing 12-month cashflow projections for planning and managing your personal finances. They include numerous detailed reports and charts and incorporate tools for doing 'what-ifs', generating 'high-level' 5-year projections and (in the Premium version) rolling projections forward on a monthly basis. Cashflow Plan requires Microsoft Excel or a compatible spreadsheet running on a device capable of clearly displaying multi-column tables. No prior experience of spreadsheeting or budgeting is needed as Cashflow Plan contains of thousands formulae and is preformatted to handle all the common income and expenditure items encountered when preparing a household budget or personal cash flow statement. Furthermore, a spreadsheet user can easily adapt Cashflow Plan to meet specific needs. Get more detailed descriptions at Products and Gallery. Get the Free version at Download Free or purchase the Premium version at Buy Premium. Plan Your Cash Flow is a registered business name. © Copyright 2018. Invest-Tech Limited. All rights reserved. Microsoft and Excel are trademarks or registered trademarks of Microsoft Corporation in the United States and/or other countries.